The Crawford Fund’s mentoring program is pleased to be welcoming Dr Robyn Alders, who will be working in Timor Leste to focus on improving nutrition with involvement of volunteers through the Australian Volunteer program. Robyn is well known to the Crawford Fund family as a Crawford Fund medal winner, and to the international community for her life-long dedication to improving food and nutrition security, with a particular focus on women and children. A good description of Robyn’s work is provided in a Crawford Fund video focused on her work in Africa. We are so pleased to have Robyn on our mentoring program team! To gather information and engage with partners in the task ahead to develop the mentoring program, Robyn and Johanna Wong, a University of Sydney PhD student who was a Crawford Fund conference scholar back in 2014, were supported by our NSW Committee to hold a 1.5-day workshop in Dili on nutrition-sensitive agriculture and value chains. It brought together representatives of the Ministry of Agriculture and Fisheries, the Ministry of Health, the National University of Timor-Leste, the Food and Agriculture Organization of the United Nations, DFAT’s TOMAK program and local and international NGOs. 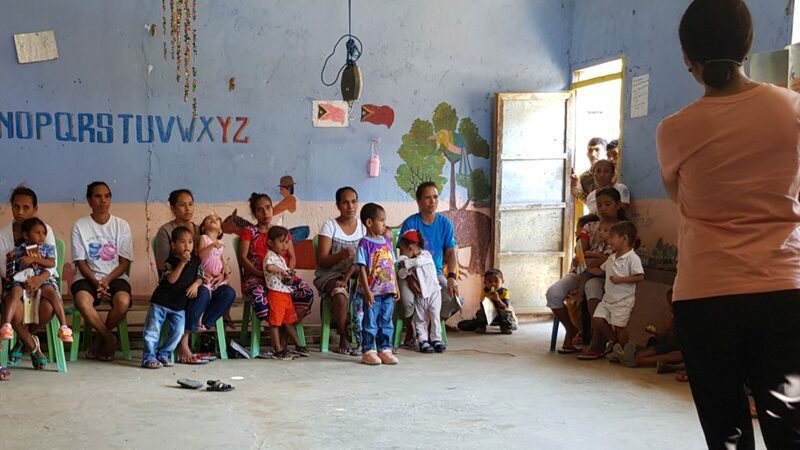 We heard at our annual conference this year that Timor-Leste, the newest nation in Southeast Asia, is battling high rates of undernutrition, with approximately half of all children under five years being stunted due to chronic undernutrition. “The Timorese Government is committed to improving the nutrition of their people through nutrition-sensitive and nutrition-specific activities. Agriculture has a key role to play in nutrition-sensitive programs through its potential to deliver nutrient-dense food and generate income that can be used to purchase food to meet household food and nutrition security requirements,” explained Robyn. Presentations covered a diverse range of topics including two presentations delivered by Johanna around her work focused on village chickens and the linkages between improving animal health and maternal and child diets and nutrition. Following the workshop, Johanna presented her findings to the six villages where she worked. “I am pleased to find that at national, municipal and local levels, people expressed their appreciation and said how rare but important it was to have village-specific data given back to those who participated in the research,” said Johanna. The opportunity to establish a mentoring program for early career agriculturalists (both Australian and Timorese) was discussed during the 1.5-day workshop and the idea was positively received, as was the suggestion of holding a Master Class on Nutrition-Sensitive Agriculture and Value Chains in Timor-Leste. Robyn is now following up on both these suggestions with plans for both the mentoring program and master class in 2019.